The research aimed to determine the transport velocities of aniline (AN) and nitrobenzene (NB) in sandy sediment so as to predict the pollution plume in sandy aquifer. The transport velocities of organic compounds in aquifer depend on various factors. This research also evaluated the effects of compound type, single or mixture solute systems, pore-water velocity (v), and pH on the transport velocities of AN and NB. These results will facilitate more precise determination of transport velocities. 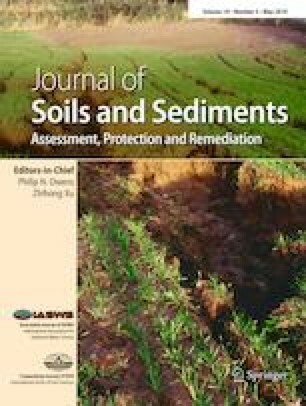 Column experiments containing sorption and desorption periods were conducted using typical sandy sediment from JiangHan Plain, China. Special emphasis was placed on the variation of compounds, solute systems, v from 4.5 to 10 cm h−1, and pH from 5 to 8.5. The transport curves of AN and NB were simulated using different sorption models coupled in HYDRUS-1D and the partition coefficient, Kd, was determined by inverse solution. The retardation coefficient (R) and transport velocity (1/R) were calculated based on Kd and the basic properties of the column. The transport velocities of AN and NB in various experimental conditions were compared and discussed. The linear non-equilibrium two-site (L2Site) sorption model coupled in HYDRUS-1D best described the sorption of AN and NB during the transport process in the sandy sediment. The 1/R values of AN and NB were 0.47–0.67 m and 0.16–0.21 m, respectively. AN transported three times faster than NB in both single and mixture systems. Lower v enhanced the transport of AN but displayed limited impact on the transport of NB in single solute system. In mixture solute system, the 1/R values of AN tended to decrease and NB increase at lower v, which suggested an interference between AN and NB transports. Both transport velocities of AN and NB potentially increase with pH. AN and NB can transport 0.47–0.67 m and 0.16–0.21 m, respectively, when groundwater flows 1 m at various experimental conditions. The transport velocities of AN and NB depend on the type of compounds, single or mixture solute system, v, and pH. All the factors should be considered when we determine the parameter, transport velocities, for prediction of pollution plume. The online version of this article ( https://doi.org/10.1007/s11368-019-02287-6) contains supplementary material, which is available to authorized users. This study was supported by a grant from the National Natural Science Foundation of China (grant nos. 41830862, 41521001), Hubei Province for Innovative Research Groups (grant no. 2018CFA028), and the Fundamental Research Funds for the Central Universities, China University of Geosciences (Wuhan) (CUG170103).